The 6th EIROforum School on Instrumentation (ESI 2019) will take place from 13-17 May 2019 and will be hosted by the European Space Agency (ESA). ESI is a biennial event, jointly organised by the Instrumentation Working Group of the EIROforum organisations, which aims to teach basic principles of instrumentation to young researchers, scientists and engineers. 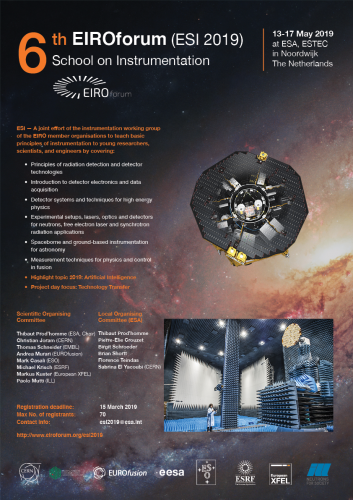 The scientific programme of ESI addresses all aspects of instrumentation related to the missions of the EIROforum organisations. The highlight topic of this sixth edition of the school will be Artificial Intelligence with a project day focussing on Technology transfer. The event will be held at the European Space Research and Technology Centre (ESTEC) in Noordwijk, the Netherlands.